Despite last week's match at Kaliningrad Stadium being somewhat muted, England's advance to the knockout stages of the World Cup has got the nation and the newsstands swept up in football fever. But what does this mean for the brands that have backed the team, the tournament and Harry Kane, England's star striker who is in pursuit of the Golden Boot? Richard Gillis, managing partner Cake says: "There’s a good story growing around England, with [team coach] Gareth Southgate and Harry Kane front and centre. Both men have the valuable attribute of appearing genuinely nice, decent people which helps mitigate the risk usually associated with personal endorsement deals." 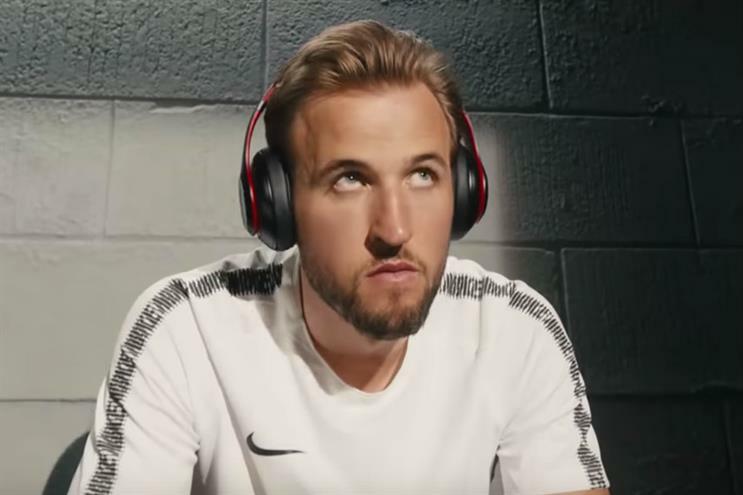 And what can individual players, like Harry Kane expect to net from his existing deals such as those with Lucozade Sport and Beats by Dre? Tim Lopez, managing director of Playerworks CSM, CSM’s specialist football division highlights the boot deal as the one to watch. "While other personal sponsors may include success-triggered bonuses, a player’s boot deal will certainly include performance based payments where significant achievements at both club and country level will be rewarded." And these payments will be linked to how far the player progresses during the tournament, with the ultimate success in the final triggering a potential bonus representing a significant percentage of the base retainer. This could be as much as 40%, Lopez believes: "Boot deals for England internationals can range between £250,000 and £3m per annum depending on their stature, the club they play for and their playing position." So for a striker like Harry Kane playing for a top-flight Premier League team, his value to a boot brand will inevitably be higher than a defender at a lower-ranking team. And should he manage to bag the coveted Golden Boot award for scoring the most goals in the tournament, further bonus payments from existing sponsors could be expected in addition to a slew of new commercial deals. "The only other Englishman to have won the award was Gary Lineker in 1986 when England progressed to the Quarter Finals. Harry would achieve iconic status if he were to return from Russia with a Golden Boot, and it is likely that this will be reflected in further bonus payments from existing sponsors, but also in a range of new and lucrative commercial opportunities that would arise from his confirmation as the golden boy of English sport," Lopez says. And if Kane follows in Lineker’s footsteps, a future as the face of a major snack brand could beckon, but as the England team progresses through to the knockout stages, what can brands do to capitalise on the moment? Tap in to the FOMO factor, says Ben Milligan, group planning director at Iris: "The magic and power of the World Cup is what it does for people. As the England team progresses, brands are dealing in something people care passionately about and a moment they’ve looked forward to for months, if not years, so if you’re going to take part, you need to remember - no-one invited you. "Our FOMO will be at fever pitch, so use your clout and cunning to break down barriers, open more doors and let me in. Don’t feign or borrow interest, be interested and interesting by either helping fans see more, whether it’s live streaming, pop-up screenings, alternative highlights packages or behind-the-scenes glimpses." And brands need to be more nimble than ever to unearth the niche trivia, human stories and fan vignettes that will fuel pub banter and watercooler moments over the next fortnight. "One of the only decent things the internet has done has been to empower people with knowledge and inspiration. Never will this added value be more important, more attainable and more under the spotlight than during this year’s tournament, because a lot has happened in the last four years to shift the power even more towards the fans, the people. This inclusiveness and equality is reflected in and enabled by the increased democratisation of content, access and opinions," Millgan added. He went on: "In a world where brands, institutions and so-called experts can’t even control the truth, let alone a trend, a crudely-fashioned meme can be wittier and more insightful than a highly paid pundit and a Snapchat story from a fan’s phone can capture a moment with more immediacy and authenticity than a TV camera. The big moments no longer happen when brands, organisers and publishers want them to, they’re atomized, unpredictable and the discourse around them is out of their hands. This calls for either unheard of levels of agility and uncomfortable levels of irreverence on the part of brands, or a willingness to relinquish control, give the fans/players/backroom staff the tools and platforms to make their voices heard, to celebrate them and allow them to open other people’s eyes, hearts and minds. It’s no longer a game where the biggest, most frequent or financed voice out-shouts the rest and ‘wins’ the World Cup. It’s no longer about World Cup ads but World Cup acts – the winners will be those who take part, putting people and human stories first." And whoever is crowned the ultimate winner on 15 July at Luzhniki Stadium, the beautiful game back home and all its brand associations are likely to be bolstered by a strong performance in this tournament. As Cake’s Gillis puts it: "Football, and the England team specifically, are culturally relevant to a large, mainstream audience. People care. This is the commodity that sport is selling above all others, which many other properties claim but fail to deliver upon." "England fans always turn up. There’s always hope just below the cynicism. And even the most one-eyed fans don't blame sponsors for defeat, which makes The FA a solid investment for marketers."